Précis: In a driving simulator, the effects of optic flow, cognitive and visual-cognitive-manual load on visual Detection Response Task (vDRT) performance were examined. 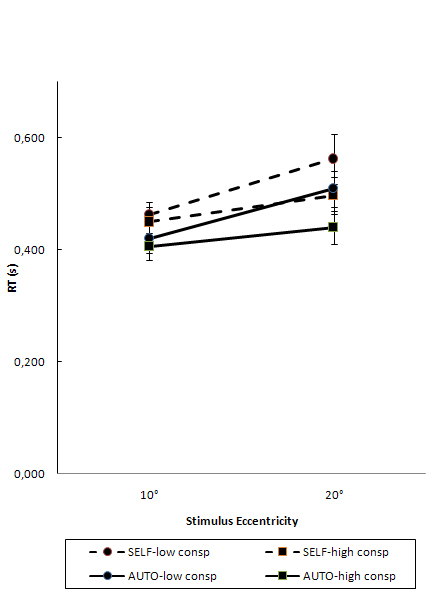 Optic flow resulted in higher vDRT response times for more eccentric stimuli, while cognitive load and visual-cognitive-manual load did not reveal a statistical interaction with stimulus eccentricity on DRT response time. Objective: In a driving simulator, a backwards counting task, a simple steering task and a fully autonomous driving task were applied to study the independent effects of cognitive load, visual- cognitive-manual load and optic flow on visual Detection Response (vDRT) performance. The study was designed to increase the understanding of the processes underlying vDRT effects. Background: The tunnel vision effect induced by a ‘steering while driving’ task found in a previous study was investigated further in this experiment. Method: Stimulus eccentricity and conspicuity were applied as within-subjects factors. Results: Cognitive load, visual-cognitive-manual load and optic flow all resulted in increased vDRT response time. Cognitive load and visual-cognitive-manual load both increased RT but revealed no interaction of task by stimulus eccentricity. However, optic flow resulted in a task by stimulus eccentricity interaction on vDRT RT that was evidence of a tunnel vision effect. Conclusion: The results suggested that optic flow may be a factor responsible for tunnel vision while driving, although this does not support the tunnel vision model because it is unrelated to workload. However, the results supported the general interference model for cognitive workload. Application: This has implications for the diagnosticity of the vDRT. During driving tasks, tunnel vision effects may occur as a result of optic flow and these effects are unrelated to workload. Keywords: workload, optic flow, Peripheral Detection Task, Detection Response Task, tunnel vision. Biography: Wim van Winsum obtained his PhD in 1996 from the University of Groningen, the Netherlands. His current research interests include attention, workload and performance. The Detection Response Task (DRT) has been applied in numerous studies of workload since it was introduced as a simple method to determine the workload demands of both the primary driving task and in-vehicle information systems (van Winsum, Martens & Herland, 1999). It has become clear since then that it is primarily sensitive to cognitive workload, see for example Bengler, Kohlman & Lange (2012), Conti, Dlugosch & Bengler (2014), Merat, Johansson, Engström, Chin, Nathan & Victor (2006) and Crundall, Underwood & Chapman (2002). Several variants of the DRT have been used in experiments, for example the tactile DRT, head mounted DRT and remote DRT, see for example Ranney, T. A., Baldwin, G., Smith, L. A., Mazzae, E., & Pierce, R. S. (2014). The version used in the current study was derived from the original Peripheral Detection Task as defined in van Winsum et al. (1999). For clarity it will be referred to as visual DRT or vDRT. The method has become a standard applied measure of cognitive load (ISO 17488:2016). In general, results of vDRT experiments have been interpreted as support for the ‘general interference model’ that states there’s a general degradation in detection performance independent of stimulus eccentricity (Crundall, Underwood & Chapman, 2002). This model predicts main effects and no interaction between task load and eccentricity on vDRT performance. According to the alternative ‘tunnel vision’ model, that claims a narrowing of the visual peripheral field as a function of workload, an interaction between task load and eccentricity is predicted. In contrast with most previous research, van Winsum (2018) found independent effects of cognitive load and the workload induced by a ‘steering while driving’ task (referred to as a visual-manual task) on vDRT response times. Cognitive load during a backwards counting task resulted in increased response time but showed no interaction of task by eccentricity. However, when stimulus conspicuity of the vDRT stimuli was lowered, ‘steering while driving’ revealed a strong task by eccentricity interaction. So, general interference was supported for the effects of cognitive load while tunnel vision was supported for task load induced by ‘steering while driving’. The present experiment was designed to study this proposed tunnel vision effect further. In van Winsum (2018) tunnel vision effects occurred only when stimulus conspicuity was lowered. Tunnel vision may be difficult to detect because it only reveals itself with stimuli that are below a certain level of conspicuity and not with very clear stimuli. The reason for that may be explained as follows, and depends on the way visual tunneling is assumed to work in this paper. Whether, and how fast, peripherally presented weak (inconspicuous) stimuli are detected may depend on the sensitivity of the peripheral visual field. Sensitivity is then defined as how fast sufficient evidence builds up for a successful detection and this sensitivity may vary and decrease at more eccentric locations. Weak stimuli, with a low level of conspicuity, can be detected quickly if the visual field is very sensitive. If the sensitivity of the visual field has been reduced for some reason, the stimulus needs to be more conspicuous to be detected quickly, or it just takes more time (response time) before sufficient evidence has built up for a successful detection. So, response time will be larger when stimulus conspicuity is lower, if stimulus presentation time is sufficiently long. If stimulus presentation time is too short then hit rate will decrease, because in that case there is not enough time to build up sufficient evidence for a hit. However, stimuli with a higher conspicuity will still be detected quickly even if the sensitivity of the visual field is reduced. So, if the sensitivity of the peripheral visual field is reduced for whatever reason, the difference in response time between stimuli with low conspicuity and stimuli with high conspicuity increases: there will be a statistical effect of stimulus conspicuity on response time in that case. Because of this, stimulus conspicuity is an important within-subjects factor in the design of the experiment. If it is hypothesized that a certain factor results in tunnel vision, we have to make sure that stimulus conspicuity of the vDRT stimuli is low enough to be sensitive to visual tunneling effects, because sensitivity may change more at eccentric locations. Since this may differ between subjects, an individual calibration procedure should be included if we want to investigate tunnel vision effects. Research has demonstated that the acuity, or spatial resolution, of the peripheral visual field decreases as the stimulus is presented at more eccentric locations (for example Anstis, 1974; Rovamo, Virsu and Naesaenen, 1978), see Ringer et al. (2016) for an overview. This is related to decreased density of the cones from central to peripheral vision but also to a central vision bias in the visual cortex. This was termed cortical magnification by Daniel & Whitteridge (1961). As argued by Ringer et al. (2016), the eccentricity related reduction of resolution due to cortical magnification must be taken into account when studying tunnel vision effects. This relates to the sensitivity threshold discussed above: the level of conspicuity (‘just above threshold’ level) must be selected just above the point where eccentricity effects caused by cortical magnification occur. A second important point to consider is that in Van Winsum (2018), the ‘steering while driving’ task was treated as a visual-manual task and it was suggested that the visual load aspect of that task had resulted in the task by eccentricity interaction. Steering while driving at a fixed speed on a curved road requires steering corrections that generate some cognitive load in addition to the ‘visual-manual’ load. The separation between visual-manual and cognitive tasks or load suggested in Van Winsum (2018) may have been unrealistic (Foley, Young, Angell and Domeyer, 2013), because most tasks in which a response is required involve cognitive load. So, cognitive load induced by the steering requirements may have been responsible for the main effect of task (driving versus baseline) on vDRT RT, instead of a separate visual load effect. 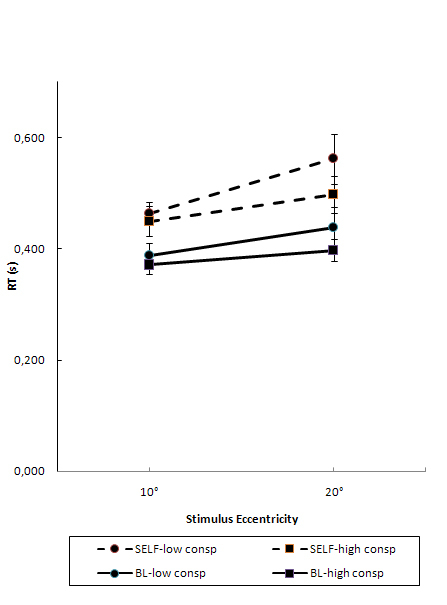 But that does not explain the task by stimulus eccentricity effect induced by the driving task. If the driving task would have resulted in added cognitive load, compared to the baseline vDRT task, the effect on vDRT RT would have been comparable to the effect of cognitive load induced by the backwards counting task, and there would have been no task by stimulus eccentricity interaction. But this was clearly not the case: the ‘steering while driving’ task resulted in a task by eccentricity interaction that was interpreted as evidence for tunnel vision. An important difference between the ‘steering while driving’ task and the baseline task was that driving involved movement and thus optic flow, while this was not the case during the stationary baseline task. Optic flow is the pattern of perceived motion of objects caused by the relative motion of an observer. Driving always involves optic flow. So, optic flow as a result of perceived self-motion may have been the cause of the tunnel vision effect that was found in van Winsum (2018). There have been a few studies that have reported eccentricity effects during tasks where optic flow may have played a role. Crundall, Underwood & Chapman (1999) studied peripheral target hit rates while subjects were watching digital video clips taken from a moving driver’s perspective. As demand (the occurrence of hazards) and eccentricity increased detection of peripheral targets decreased dramatically. So there was a definite effect of eccentricity. In a study of Crundall, Underwood & Chapman (2002) a main effect of both processing demand and eccentricity was found on target hit rate. However, since the interaction of task complexity (high vs. low) by eccentricity was not significant in both studies, the results were interpreted in favour of general interference. Because performance on a stationary baseline task was not measured, the independent effect of optic flow cannot be established from these results. At present, to the knowledge of the author, there are no models that explain why optic flow would induce tunnel vision. The higher rate of change of visual information (perceived angular velocity of objects) at larger eccentricities compared to foveal information during movement may result in slower detection of peripheral objects or of fixed peripherally projected vDRT stimuli, resulting in a task by eccentricity interaction. So, although the underlying process or mechanism is unclear, optic flow is a possible factor underlying tunnel vision effects while driving that warrants further investigation. However, this would not be the tunnel vision effect according to the tunnel vision model, referred to above, that claims a narrowing of the visual peripheral field as a function of workload, because it may not be related to workload. The present study then addresses the following question: Is optic flow induced by driving responsible for the task by eccentricity interaction for stimuli with a low conspicuity, as reported in van Winsum (2018)? In order to test this, vDRT performance during a ‘steering while driving’ task is compared with autonomous driving, where the simulator vehicle drives in fully autonomous mode. ‘Steering while driving’ involves visual-cognitive-manual load AND optic flow, while autonomous driving involves only optic flow, because subjects only have to sit and watch and not perform any action apart from the vDRT task. In addition, the independent effect of cognitive load will be examined. The experiment was performed using a driving simulator of Carnetsoft. For a description, see van Winsum (2018). A one-lane road with a lane width of 2.5 m was part of the virtual envirnoment. The road was semi-circular with continuous white edge lines. It consisted of a sequence of curved left-turning and right-turning road segments, with radii between 150 and 500 m. In order to promote optic flow effects, white roadside posts were positioned along both sides of the road with an inter-object distance of 50 meters. Stimulus background of the red vDRT stimuli was made invariant during all tasks by rendering a mild exponential light gray fog (RGB of 0.7, 0.7, 0.7). This ensured that optic flow effects were not contaminated by background movement artefacts that would result in random variations in stimulus conspicuity. The fog did not affect forward vision on the road since sight distance was around 500 meters. Before the start of each task subjects read the task instructions from a paper. They were instructed to look forward and not to direct their gaze at the vDRT stimuli. Backwards Counting Task (BC): Cognitive load. This task lasted around 4 minutes and consisted of counting back silently from 300 in steps of one. In order to ensure that the task was the same for all subjects, it was paced by an auditory click each second. Van Winsum(2018) and Bengler, Kohlman & Lange (2012) found that this task affected vDRT performance. The task is derived from the Serial Threes task discussed in Kennedy & Scholey (2000). Driving Task: Visual-cognitive-manual load versus optic flow. Subjects faced the middle monitor, while their position was visualized as being seated in the left front seat of a car. The car pulled up to 100 km/h in order to make sure that speed was the same for all subjects. Visual-cognitive-manual load (SELF): In one driving condition subjects were required to steer the car within the lane boundaries and to give priority to the steering (primary) task. Speed control was handled by the simulator car. The curvature of the road required continuous steering in order to stay within lane boundaries. Subjects were instructed to look far ahead at the course of the road. The perceptual-response coupling of steering while driving at a speed of 100 km/h on a narrow road induced a relatively high load. Optic flow (AUTO): In the second driving condition, the vehicle was set to drive fully autonomous, without any speed- or steering control of the subjects. The driving environment was identical as in the SELF condition. In the AUTO condition, optic flow was the same as in the SELF condition, but there was no visual, cognitive or manual load, since subjects only had to sit and watch. The car pulled up to 100 km/h, drove at a constant speed and stayed between the lane boundaries autonomously. Again, subjects were instructed to look far ahead at the course of the road. Visual Detection Response Task (vDRT). vDRT stimuli were 0.5×0.5 cm red semi-transparent squares that were presented on the middle rendering channel, 4.5 cm above the horizontal centerline. Stimuli were presented with random variation between 3 and 5 s, at a horizontal angle of either 10° or 20° (eccentricity) to the left or the right of the line between the eyes of the subject and the centre of the middle monitor. So, in contrast to most other vDRT studies where stimuli were presented only to the left, the vDRT stimuli were presented to both sides of the vertical center line of the monitor. This measure was applied in order to reduce the expectancy of the location where the stimulus was presented and to avoid that subjects direct their gaze to the vDRT stimuli. Subjects were seated such that the distance between eyes and middle monitor was 55 cm. Within each trial, 28 vDRT stimuli per eccentricity (56 in total) were presented semi-randomly, same number to the left and right. Each vDRT measurement trial took around 4 minutes. 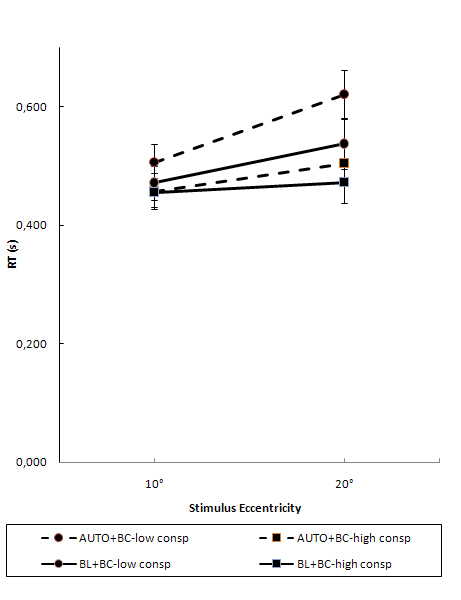 Stimulus eccentricity was manipulated as a within-subjects factor within trials. Stimulus conspicuity was manipulated as a second independent within-subjects factor within trials. As in van Winsum (2018) conspicuity was varied by using red stimuli (RGB of (1, 0, 0)) with different alpha (transparency factor) values. Before the experiment started, the individual subjects’ sensitivity to different levels of conspicuity was measured using a calibration procedure, see next paragraph. In that procedure, the ‘just above threshold’ (JAT) value of stimulus conspicuity was determined for each subject separately. This is the stimulus conspicuity level where RT is the same for both eccentricities. This subject-dependent JAT conspicuity was applied as the Low Conspicuity level. The High Conspicuity level was determined by adding 0.10 alpha (α) to the Low Conspicuity level. So, if for example the JAT stimulus had an alpha value of 0.15, then the higher conspicuity level was set at 0.25 alpha. α = 1.0 is fully opaque while α = 0.0 is fully transparent. Subjects were instructed to look forward, not look directly at the vDRT stimuli and, as soon as the red square stimulus was detected, press the response button on the steering wheel with the right thumb, that was positioned on the response button throughout the task. As a feedback cue, pressing the response button generated a sound click. 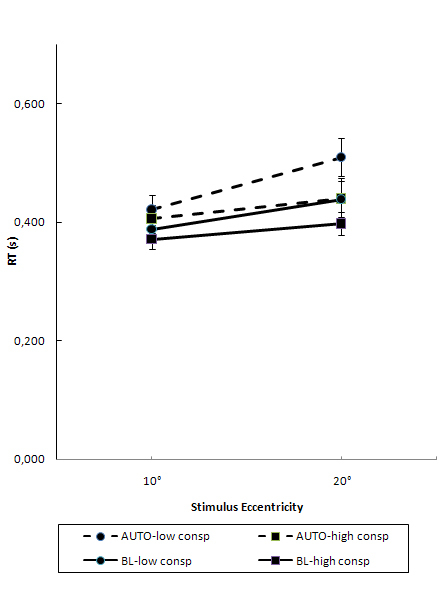 The stimulus was removed immediately as soon as the response button was pressed, or when it was on-screen for more than 2.0 s: maximum stimulus duration was 2.0 s.
Average response time (vDRT RT) was computed for each level of eccentricity and conspicuity separately, if a response was measured within 2200 ms after stimulus onset (a ‘hit’). This value was chosen because we wanted only responses to be triggered by the onset of the stimulus. If a stimulus is weak, the change, as caused by either switching the stimulus on or off, can trigger a response. A response generated after 200 ms after the switching off of the stimulus was therefore coded as missing. Hit rate was computed as the number of hits divided by the total number of stimuli (14 per trial per eccentricity and conspicuity level). So, dependent variables were vDRT RT and hit rate. The present version deviates from the ISO 17488:2016 standard in a few respects. The reasons for that have been discussed in van Winsum (2018). If such a level existed, the first level above was selected as the JAT level. So, if the 0.125 alpha stimuli resulted in a much larger (>20% higher) RT in the 20° eccentricity compared to the 10° stimuli, then a value of 0.150 was selected as the JAT level. If no such level was found (no eccentricity effect for all alpha levels) then a JAT level of 0.100 alpha was selected. First the vDRT task was practiced for 15 stimuli, which took about 1 minute. After that, the Backwards Counting Task was practiced for 100 s. Then the steering task was practiced for 5 minutes. BL: Baseline vDRT measurement: stationary non-moving scenery. BL+BC: Backwards Counting task + vDRT measurement: stationary non-moving scenery. AUTO: Autonomous driving at 100 km/h + vDRT measurement. Autonomous driving with a speed of 100 km/h + vDRT measurement. AUTO+BC: Autonomous driving at 100 km/h + Backwards Counting Task + vDRT measurement. SELF: Driving at 100 km/h ‘steering while driving’ + vDRT measurement. Subjects were 16 young men with an average age of 18.7 years (SD=1.01, range 18 to 21). Six subjects were licenced drivers (for an average of 1 year) while ten had not obtained their licence yet, so driving experience for all subject was limited. This research complied with the tenets of the Declaration of Helsinki. Informed consent was obtained from each participant. A homogenous sample, in terms of age, was selected to reduce the amount of unexplained variance, since age has a strong effect on DRT RT (Strayer, Cooper, Turrill, Coleman, and Hopman, 2015). Average vDRT RT and hit rate were computed for each level of eccentricity and conspicuity separately. All data were analysed with SPSS using a repeated measurements analysis of variance design. The within-subjects factors were Task, Conspicuity and Eccentricity. – BC vs. BL to analyze cognitive load effects (high vs. low cognitive load). – AUTO vs. BL to analyze optic flow effects (moving vs. stationary). – AUTO+BC vs. BL+BC to analyze the combined effects of cognitive load and optic flow. – SELF vs. BL to analyze the combined effects of visual-cognitive-manual load and optic flow. – SELF vs. AUTO to analyze the separate effects of visual-cognitive-manual load and optic flow. Conspicuity consisted of two levels: Low conspicuity (the ‘just above threshold stimulus’) vs. High conspicuity (a clearer stimulus with 0.100 alpha added to the Low conspicuity level). Eccentricity: 10° and 20° horizontal visual angle of the vDRT stimulus, both to the left and right of the center of the monitor. The average JAT stimulus level was 0.12 alpha, with 9 subjects at a 0.100 level, 3 subjects at 0.125, 2 subjects at 0.150 and 2 at 0.175 JAT level. Table 1 presents the statistical effects of the factors Conspicuity and Eccentricity on vDRT RT. TABLE 1: Effects of Conspicuity and Eccentricity on vDRT Response Time. The main effect of Conspicuity was statistically significant: as can be seen in Figure 1, less conspicuous stimuli resulted in longer RTs. 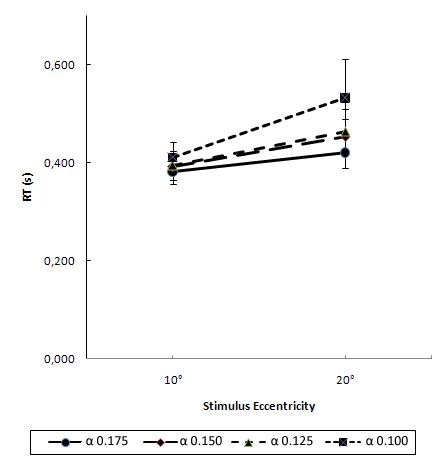 Also, the main effect of Eccentricity was significant: more eccentric stimuli resulted in longer RTs, but especially so for the less conspicuous stimuli as evidenced by the statistically significant Conspicuity x Eccentricity interaction. Figure 1. vDRT as a function of Stimulus Eccentricity and Conspicuity. Vertical bars indicate standard deviations. This stronger effect of eccentricity on vDRT RT at lower conspicuity levels is probably the result of cortical magnification. Table 2 presents an overview of the hit rate for each factor. In most cells the average was 1.00, which is a hit rate of 100%. As a result standard deviation was 0.0 in most cells: the lack of variance prohibited statistical analysis. Therefore only the effects on vDRT RT are reported in the next paragraphs. Table 3 presents the statistical effects of the factors Cognitive Load, Conspicuity and Eccentricity on vDRT. TABLE 3: Effects of Cognitive Load, Conspicuity and Eccentricity on vDRT Response Time. Note. Cognitive Load levels are backwards counting task versus baseline. The main effect of cognitive load was simply additive, as can be seen by the parallel lines in Figure 2 and the absense of statistically significant interactions with Cognitive Load. The Conspicuity x Eccentricity interaction was significant. This suggests that the calibration procedure was a bit too restrictive in that the ‘just above threshold’ conspicuity level should have been a bit higher. Figure 2. Backwards counting task versus baseline. vDRT RT as a function of Cognitive Load, Conspicuity and Eccentricity. Vertical bars indicate standard deviations. To test the effect of optic flow, the AUTO (driving) task was compared with the stationary BL task. Also, it was tested whether the effects of Optic Flow and Cognitive Load were independent, see Table 4. TABLE 4: Effects of Optic Flow, Cognitive Load, Conspicuity and Eccentricity on Response Time. Note. Optic Flow levels are AUTO drive vs. baseline. Cognitive Load levels are AUTO+BC vs AUTO and BL+BC vs. BL. Effects of Optic Flow. Optic flow resulted in increased vDRT respond times, as indicated by the statistically significant main effect and shown in Figure 3a and 3b: the dashed lines (Optic Flow) are higher compared to the solid lines (stationary BL). This suggests that Optic Flow resulted in poorer vDRT performance. Also, the main effects of Conspicuity and Eccentricity were statistically significant. However, the Optic Flow x Eccentricity interaction was statistically significant as well, as can be seen in Figures 3a and 3b by the diverging lines for the AUTO condition compared to Baseline. Although this resembles tunnel vision as stated by the tunnel vision model, it is not related to workload. The Optic Flow x Conspicuity interaction was statistically significant as well. From inspection of Fig. 3 it appears that this is mainly the case during the AUTO+BC condition. Figure 3a (left). Optic Flow: AUTO drive (optic flow) versus baseline. Figure 3b (right). Optic Flow + Cognitive Load: AUTO drive (optic flow)+backwards counting task versus baseline+backwards counting task. Vertical bars indicate standard deviations. Effects of Cognitive Load: Cognitive Load produced a strong statistically significant main effect: the lines in Figure 3b are shifted up relative to Figure 3a. The Cognitive Load x Eccentricity interaction was not significant: Cognitive Load did not produce tunnel vision. However, the interaction between Cognitive Load and Conspicuity was statistically significant: the effects of Cognitive Load on response times to weak stimuli is larger compared to clear stimuli. Steering on a narrow lane at 100 km/h induced a visual, cognitive and manual load but it also generated optic flow. Table 5 gives an overview of the statistical effects of SELF vs. BL. Figure 4a shows the effects graphically. TABLE 5: Effects of Visual-Cognitive-Manual (VCM) Load + Optic Flow (SELF), Conspicuity and Eccentricity on vDRT RT. Note. Visual-Cognitive-Manual Load + Optic Flow levels are SELF driving task versus baseline. Figure 4a (left). Self driving (SELF) versus baseline (BL). Figure 4b (right). Self driving (SELF) versus Autonomous Driving (AUTO). vDRT RT as a function of Task, Conspicuity and Eccentricity. Vertical bars indicate standard deviations. The main effect of the ‘steering while driving’ task (visual-cognitive-manual load or VCM load) was statistically significant, as can be seen in Figure 4a. As before, the main effects of Conspicuity and Eccentricity and the Conspicuity x Eccentricity were statistically significant as well. The Self driving x Eccentricity interaction was statistically significant, similar to the AUTO condition, where the interaction was attributed to Optic Flow. The AUTO vs. SELF tasks were analyzed separately to tease out the independent effects of Optic Flow and VCM load, see Table 6 and Figure 4b. The main effect of VCM Load (SELF vs. AUTO) was statistically significant: VCM load as a result of steering within a narrow lane increased vDRT RT. The VCM Load x Eccentricity interaction was not significant. Also, the VCM Load x Conspicuity interaction was not significant. So, Visual-Cognitive-Manual Load did not result in tunnel vision and the (VCM Load + Optic Flow) x eccentricity interaction in Table 5 appears to be the result of the eccentricity related reduction in DRT performance induced by Optic Flow. TABLE 6: Effects of Visual-Cognitive-Manual (VCM) Load, Conspicuity and Eccentricity on vDRT RT. Note. Visual-Cognitive-Manual Load levels are SELF driving task versus AUTO. The effects of optic flow, cognitive load and visual-cognitive-manual load on vDRT performance were examined. Cognitive load was varied using a backwards counting task. Visual-cognitive-manual load was manipulated by steering while driving on a narrow winding road with a speed of 100 km/h. Optic flow was manipulated by fully autonomous driving on that same road with 100 km/h without steering. Since steering while driving always involves both optic flow and visual-cognitive-manual load, the visual-cognitive-manual load component consists of the difference between self-steering task (SELF) and autonomous driving task (AUTO). In van Winsum (2018) it was found that the steering task resulted in a Task Load x Eccentricity interaction that suggested tunnel vision. It was then assumed that the visual load induced by the steering task had resulted in tunnel vision, because the task required considerable visual attention. However, steering not only results in visual load, it also generates cognitive and manual load and the task results in optic flow. In the present study it was investigated whether one of those factors, optic flow, induces an eccentricity related reduction in DRT performance. Since hit rate was 100% is most cases, it lacked sufficient variance for statistical analysis. A possible explanation for the high hit rates in the present experiment, similar as in van Winsum (2018), was the short vDRT RT’s: fast reactions go together with high hit rates (van Winsum et al., 1999). The short RT’s are probably the result of the young age of the participants, because DRT RT’s are shorter for younger drivers (Strayer, Cooper, Turrill, Coleman, and Hopman, 2015). A calibration procedure was designed to select the ‘just above threshold’ level of conspicuity for each subject individually. 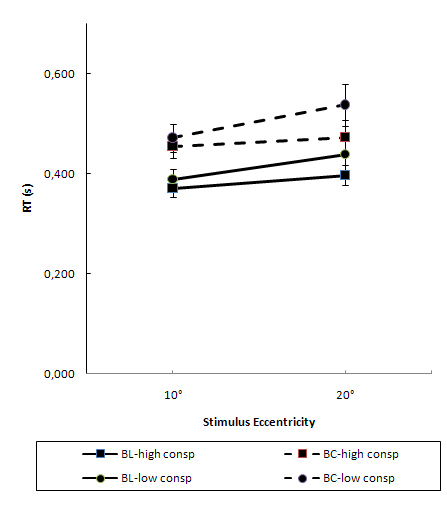 The Conspicuity x Eccentricity interaction (Figure 1) was most probably the result of cortical magnification that was revealed at low vDRT stimulus conspicuity levels, but absent at higher levels of conspicuity. For the baseline condition a statistically significant Conspicuity x Eccentricity interaction was found, which was also present in the other conditions. This suggests that the ‘just above threshold’ conspicuity level should have been assigned bit higher during the calibration procedure. The main effect of Cognitive Load was statistically significant and there was no significant interaction with Stimulus Eccentricity. This confirms the results of van Winsum (2018). The effects of Optic Flow were statistically significant. There was also a significant Optic Flow x Eccentricity interaction. This suggests that Optic Flow generates tunnel vision. Also during the AUTO task the main effect of Cognitive Load was statistically significant. However, the interaction with Eccentricity was not significant, so again, there was no evidence that Cognitive Load produces tunnel vision. The Cognitive Load x Conspicuity interaction was statistically significant as well and this appeared to occur mainly in the Optic Flow condition. A possible reason could be that evidence accumulation for DRT stimulus detection is slower as a result of higher cognitive load (Castro, Strayer, Matzke & Heathcote, 2017) and optic flow, which would then take even longer for stimuli with lower conspicuity. More research is needed to answer that question. Visual-Cognitive-Manual (VCM) load, as a result of steering while driving, increased vDRT. The VCM load x Eccentricity interaction was not significant: VCM load did not result in tunnel vision. Also, the interaction between VCM load and Conspicuity was not statistically significant. Although the interaction of Task by Eccentricity was significant for the Self driving task against Baseline, this interaction was caused by optic flow and not by VCM load. So the results for Visual-Cognitive-Manual load support general interference, same as for cognitive load, and both the backwards counting task and the ‘steering while driving’ task probably affected DRT in the same way, via the cognitive load component. In addition, the evidence presented suggests that optic flow results in tunnel vision. In that case, this Task by Eccentricity effect is not the same as the tunnel vision predicted in the tunnel vision models, since it is not related to workload. However, it does resemble tunnel vision and the term would still be appropriate, but its like an amplified cortical magnification effect, as if cortical magnification occurs at a higher conspicuity level as a result of optic flow. It must be noted however, that the DRT stimuli were stationary in the optic flow field during the driving tasks, so whether optic flow generates tunnel vision as evidenced by slower detection of peripherally located objects in real world driving needs to be investigated further. There are a few differences between the present study and van Winsum (2018). In van Winsum (2018) the low conspicuity stimuli had 0.30 alpha transparancy, while in the present study, that value was lower, often 0.10. One would then expect larger response times in the present study but they were in fact comparable. This may have been related to the visual background of the stimuli: vDRT stimuli were projected on top of a gray background, generated by mild fog, in order to have uniform foreground-background colours throughout the experiment. In van Winsum (2018) stimuli were projected on a background of blue sky with thin layers of white clouds. During movement, this may have resulted in random variations of stimulus conspicuity. How this interacted with optic flow is not clear but more eccentric stimuli could have been a bit less noticable. In addition, in van Winsum (2018) subjects were required to restrict their gaze to a white fixation cross projected on the middle of the monitor. In the present experiment, subjects were instructed to look forward and attend to the course of the road. Gaze fixation to objects nearby may be related to tunnel vision effects in addition to optic flow. During night driving, while driving in dense fog or high traffic density conditions, drivers often focus their attention to an area closer in front of the vehicle. It would be interesting to study if this attentional narrowing to a small region closely in front of the vehicle enhances the tunnel vision effects invoked by optic flow. Also, time-on-task or prolonged driving may affect tunnel vision as a result of optic flow. In the present experiment, task durations were only a couple of minutes. It is not clear whether tunnel vision may increase and become more prominent for more conspicuous objects after prolonged driving and this will be investigated in a next experiment. The practical significance for DRT studies is, first of all, that eccentricity effects are related to optic flow and not to cognitive load. So, for workload measurements, the evidence appears to indicate that eccentricity effects are not relevant. Reducing the conspicuity of the DRT stimulus will increase the sensitivity of the DRT method to task demands: the procedure was sensitive enough to measure the effects of cognitive load in a relatively easy driving task (steering while driving). However, on a broader theoretical level, the finding that optic flow appears to be related to some form of tunnel vision is relevant, especially for traffic safety. Based on the present data it would be too speculative to attribute the optic flow effects to specific brain mechanisms or attentional processes. Further investigation into the underlying process that causes optic flow to generate the tunnel vision effects described in this study is therefore warranted. Cognitive load and visual-cognitive-manual load resulted in higher vDRT reaction time, while these factors did not interact with stimulus eccentricity: for cognitive and visual-cognitive-manual load the results matched the general interference model. Optic flow while driving resulted in higher vDRT reaction time and a significant interaction of optic flow and stimulus eccentricity was found: this is evidence that optic flow induces eccentricity related reduction in DRT performance, although further studies need to consider this in more detail. Anstis, S. M. (1974). A chart demonstrating variations in visual acuity with retinal position. Vision Research, 14, 589–592. Bengler, K., Kohlmann, M., & Lange, C. (2012). Assessment of cognitive workload of in-vehicle systems using a visual peripheral and tactile detection task setting. Work, 41(Suppl 1), 4919–4923. Castro, S., Strayer, D., Matzke, D. & Heathcote, A. (2017). Modeling the Detection Response Task. 10.13140/RG.2.2.34616.44800. Conti, A. S., Dlugosch, C., & Bengler, K. (2014). The effect of task set instruction on detection response task performance. In D. de Waard et al. (Eds. ), Proceedings of the human factors and ergonomics society europe chapter 2013 annual conference (107 – 117). Crundall, D., Underwood, G. & Chapman P. (1999). Driving experience and the functional field of view. Perception, 28, 1075-1087. Crundall, D, Underwood, G. & Chapman, P. (2002). Attending to the Peripheral World While Driving. Applied Cognitive Psychology, 16, 459-475. Daniel, P. M., & Whitteridge, D. (1961). The representation of the visual field on the cerebral cortex in monkeys. Journal of Physiology, 159, 203–221. Foley, J.P., Young, R., Angell, L. & Domeyer, J.E. (2013). Towards Operationalizing Driver Distraction. Iowa Research Online, 2013 Driving Assessment Conference: PROCEEDINGS of the Seventh International Driving Symposium on Human Factors in Driver Assessment, Training, and Vehicle Design, p. 57-63. ISO 17488:2016, Road vehicles – Transport information and control systems – Detection-Response Task (DRT) for assessing attentional effects of cognitive load in driving. (2016). Geneva: International Organization for Standardization. Kennedy, D.O. & Scholey, A.B. (2000). Glucose administration, heart rate and cognitive performance: effects of increasing mental effort. Psychopharmacology, 149(1), 63-71. Merat, N., Johansson, E., Engström, J., Chin, E., Nathan, F., and Victor, T. (2006). Specification of a secondary task to be used in safety assessment of IVIS, AIDE Deliverable 2.2.3, European Commission, IST-1-507674-IP. Ranney, T. A., Baldwin, G., Smith, L. A., Mazzae, E., & Pierce, R. S. (2014). Detection response task evaluation for driver distraction measurement application. (Report No. DOT HS 812 077), National Highway Traffic Safety Administration. Ringer, R.V., Throneburg, Z., Johnson A.P., Kramer, A.F., Loschky, L.C. (2016). Impairing the useful field of view in natural scenes: Tunnel vision versus general interference.. Journal of Vision, 16(2):7, 1–25. Rovamo, J., Virsu, V., & Naesaenen, R. (1978). Cortical magnification factor predicts the photopic contrast sensitivity of peripheral vision. Nature, 271, 54–56. Strayer, D. L., Cooper, J., Turrill, J., Coleman, J. R., & Hopman, R. J. (2015). Measuring cognitive distraction in the automobile III: A comparison of Ten 2015 in-vehicle information systems. Washington, DC: AAA Foundation for Traffic Safety. van Winsum, W., Martens, M., & Herland, L. (1999). The effects of speech versus tactile driver support messages on workload, driver behaviour and user acceptance. Soesterberg: TNOHuman Factors Research Institute (Report No. TM-99-C043). van Winsum, W. (2018). The Effects of Cognitive and Visual Workload on Peripheral Detection in the Detection Response Task. Human Factors, 60 (6), 855–869.